Alice Neel was eighty years old when she resumed painting a self-portrait she had begun some four years earlier. In it she leans attentively forward, one eyebrow raised in critical assessment of her subject, glasses perched on her nose as if to sharpen her clarity of vision. She wields her paintbrush as a suggestion that she is in the act of painting, but she omits the requisite easel and canvas, knowing they would block the beholder’s view of her entirely naked body. Neel’s white hair is gathered decorously in a bun on top of her head, but nearly everything else sags—her sloping shoulders, her ponderous breasts, her fleshy belly, the skin around her swollen ankles. The artist is unflinching in her portrayal of the physical effects of the passage of time, mercilessly stripping away every layer that could obscure the reality of her physical condition. The blue lines, so characteristic of her mature style, clearly demark the contours of her embodiedness, while her expressive brushwork fleshes out the volume of her form, giving weight to her presence. Her body may appear worn out, but there is animation in the alertness of her gaze, in the playful vertically striped upholstery of the chair, and in the gesture of her hand poised to paint, that lend the work levity even in its seriousness. The painting is not a lament; it is a testimony. Neel’s penetrating stare confronts the viewer, challenging him to look, inquiring if he really sees. There is no sentimentality about Neel’s self-portrait, there is only honesty—the trait most consistently associated with Neel’s oeuvre. Artist Frank Auerbach characterized the strident honesty of her work as “patent and shaming.” She bravely displays the imperfections of her elderly body not as an act of exhibitionism, but as an act of revelation. She knew there was no other way to communicate the truth of the aging process apart from depicting it in full flower. The title of the book published to accompany the most comprehensive retrospective of Neel’s work, Painted Truths, witnesses to the fact that Neel’s brand of expressive realism, noted for its psychological depth, conveys truth visually, not propositionally. Her realism is expressive in the sense that she often allows distortions in the physical traits of her subjects to illuminate some inner truth that would be obscured by a slavishly accurate rendering—for instance, the barely executed, loose contours of the hands of a young boy with cerebral palsy in Don Perlis and Jonathan (1982) point subtly to the degenerative nature of the debilitating disease, while the exaggerated green pallor of the mother in Pregnant Woman (1971) reveals the discomfort and anxiety of a woman struggling with pre-eclampsia in late-term pregnancy. Neel’s portrayal of aspects of the body that communicate something deeper about the psychological state of a subject demonstrates her innate understanding that mind, body and soul are intimately tethered. John of Damascus resists too stark a duality of body and soul, insisting on a unity that facilitates comprehension of spiritual truth. It is precisely this unity of body and soul that Neel’s portraits so powerfully convey. The integrity of the bodily form in her portraits was a calculated reaction to the tendency of cubism and abstract expressionism to rend the body asunder in pursuit of, in the case of the former, revealing hidden meaning by exposing underlying formal structures and, in the case of the later, in pursuit of uninhibited freedom of expression. In both cubism and abstract expressionism the body is often sacrificed for access to the soul—a condition that Neel once described as “the human race torn to pieces.” On the other hand, Neel repudiated the cool detachment of pop artists such as Andy Warhol and Alex Katz who produced portraits that objectified the figure—the sacrifice of the soul in exclusive attention to the body. Perhaps Neel sensed the connection between her artistic approach to the figure and Byzantine aesthetic sensibility, an awareness suggested by her occasional allusions to Byzantine iconography. For instance, she appropriates the flat golden background so characteristic of Byzantine icons in her portrait Art Shields (1951) in a way that hints at the saintliness of this very human journalist who was the labor reporter for a Communist newspaper. If Jeremy Lewis’s reading of the aureate background as a metaphor for spiritual purity is accurate, then Neel is adopting Byzantine visual language, not subverting it. But even if Neel’s work was in step with a Byzantine aesthetic in its insistence on a unity of mind and matter, soul and body, it also deviated markedly in some important regards, nowhere more so than in her flagrant display of her own presence in a painting. Neel allowed her gestural, expressive brushwork and revisions to remain in the painting, a stylistic trait anathema to Byzantine art. The skill of the iconographer was evidenced by the extent to which he could obscure his own existence and disappear behind the painting that was intended to evoke the presence of the archetype, but never the artist. Neel, through her engagement with her living subjects, retains her own subjectivity, intentionally incorporating it into the work, leaving visual proof of her presence for the viewer to discern. This artistic convention is meaningful: the content of Neel’s portraits is not solely the identity of the individuals who appear on the canvas, but includes Neel’s experience of her encounter with these subjects at a certain place and time. The truth of the painting is in the encounter of one subject—the painter—with another subject—the sitter. In the act of identifying, Neel’s attention is on an event, a historical moment when two people come together for the purpose of mutual understanding. The feminist art critic Linda Nochlin, herself the subject of more than one of Neel’s portraits, described the way the artist engaged with her sitters: inquiring, commenting, entertaining and joking while painting. Consequently, Neel’s subjects often gaze directly at the viewer as if riveted by a moment in an ongoing conversation. In Neel’s 1973 portrait of Nochlin and her daughter Daisy, both subjects appear alert, and Daisy’s lips are slightly open as if she’s about to respond to the repartee. The attentiveness of the women in the painting invites the viewer to join the dialogue. The experience of art and the Christian religious experience share this dynamic of truth. The Gospels, in particular, testify to one transformative encounter after another: Jesus heals a man born blind, lifts a lame man to his feet, multiplies the lunch of one small boy to satisfy the hunger of thousands, raises his friend Lazarus from the dead, breaks bread with his disciples after his resurrection, and forgives Peter after his betrayal, restoring him to fellowship. Each of these encounters reverberates with significance, all carrying within them signs of the arrival of the Kingdom of God and the promise of the restoration of a fractured world. In each instance the truth is as much in the event as it is in what is verbally stated during the encounter. The dignity with which Neel imbued her sitters while taking into account their frailties is perhaps the most Christian aspect of her paintings. In her ability to hold together the beauty and the brokenness of the human form and spirit, her works testify to both the dignity of humanity crafted in the image of God and the real effects of the fall. In her depiction of Andy Warhol (1970) we see this aspect of her work in full force. Neel strips away the aura that surrounded Warhol in his blazing success as artist and pop culture icon, portraying him as vulnerable, yet defiant in the face of that vulnerability, as broken and scarred, yet hovering on the brink of redemption. Could there be any more succinct summation of the human condition? Frank Auerbach, “Artist Apprecitations,” in Alice Neel: Painted Truths, eds. Jeremy Lewiston and Barry Walker (New Haven: Yale University Press, 2010), 93. Barry Walker, “Dividing up the Canvas” in Alice Neel: Painted Truths, 78. St John of Damascus, Three Treatises on the Divine Images, trans. Andrew Louth (New York: St. Vladimir’s Seminary Press, 2003), 3.12. Tamar Garb, “’The human race torn to pieces’: The Painted Portraits of Alice Neel,” in Alice Neel: Painted Truths, 18. Gervase Mathew, Byzantine Aesthetics (John Murray: London, 1963), 23-24. Jeremy Lewiston and Barry Walker, eds., Alice Neel: Painted Truths, 126. There are additional instances when Neel’s portraits reference Byzantine iconography. In the painting Richard at Age Five (1945), Richard, who was legally blind, has noticeably enlarged eyes, a trait that “recalls Byzantine icon paintings in the overscaling and intensity.” Ibid., 117. The positioning of the subjects in Mother and Child (1967) was almost certainly inspired by the recognizable icon of the Virgin known as the Glykophilousa, or Mother of Tenderness, in which Mary presses the infant Jesus’ cheek to her own. For a discussion of the meaning of this icon type see Hans Belting, Likeness and Presence: A History of the Image before the Era of Art (Chicago: University of Chicago Press, 1997), 281–296. Italics added. Marlene Dumas, “Artists’ Appreciations,” in Alice Neel: Painted Truths, 94. 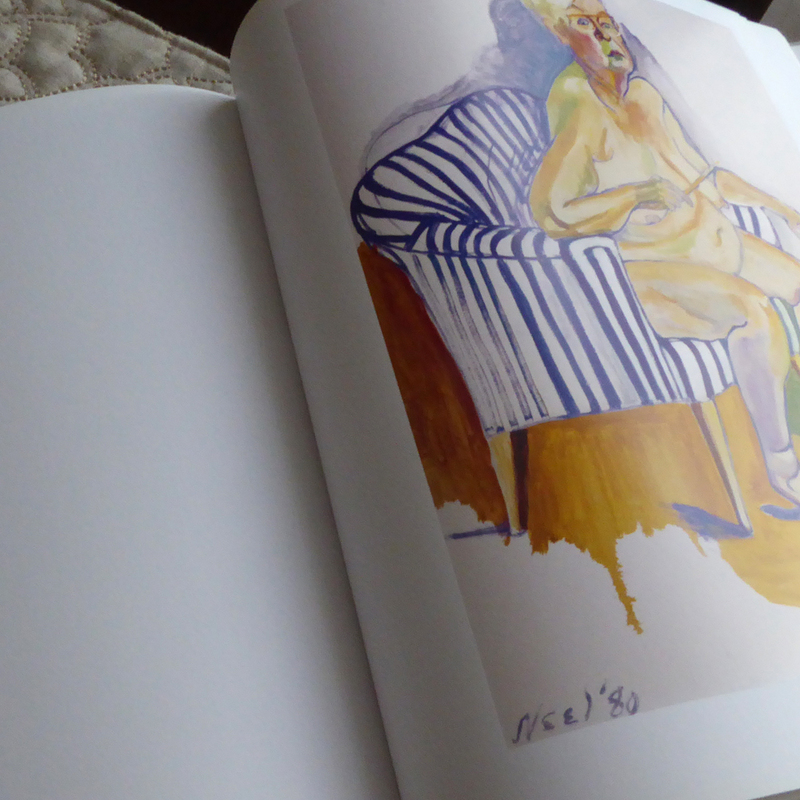 Tamar Garb, “’The human race torn to pieces’: The Painted Portraits of Alice Neel,” in Alice Neel: Painted Truths, 29. My comment reflects Gadamer’s insight that the work of art needs interpretation in the form of linguistic mediation, but that the meaning of the work cannot be exhausted by linguistic expression, however insightful and thorough. See Vattimo’s discussion of Gadamer in Art’s Claim to Truth, 132-135. Ibid., 132–133. This quote reflects Gadamer’s understanding of the Heidegger’s notion of truth as event. For Vattimo’s discussion on this aspect of Heidegger’s aesthetics, see Art’s Claim to Truth, 156-157. John 9, Luke 5:17-36, Luke 9:10-17, John 11:1-44, Luke 24:13-49, John 21:1-19. Italics added. Tamar Garb, Alice Neel: Painted Truths, 28-29.